Dining tables are necessary in every house because they bring all the member of the house to sit and eat together. Whenever you think of dining table the first thing that comes to the mind is the food. It has been a worldly trend to sit and eat on the dining table. 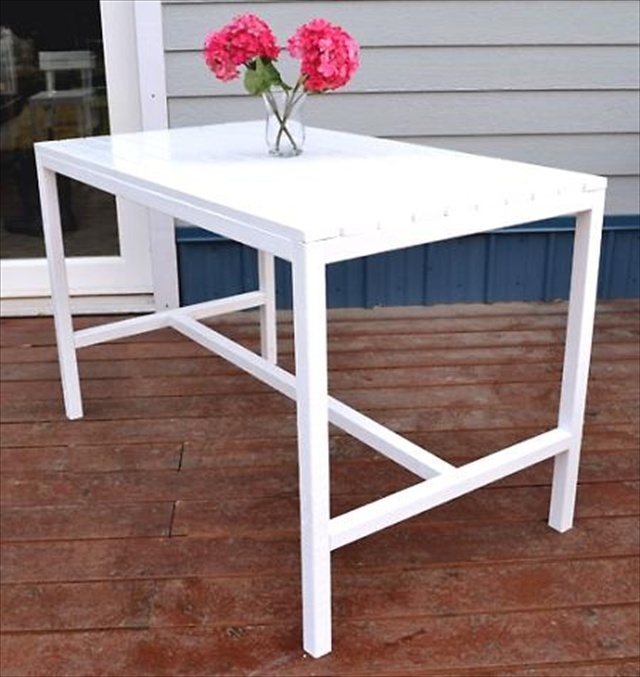 Nowadays people prefer pallet dining tables because they are easy to make and inexpensive than the ones you purchase from the market. The pallet dining table completes the house and gives it beautiful and nice look as well. It can be build in small or huge size if you are thinking of making it by your own otherwise you would have limited choices if you go to the market. Obviously the bigger the dining table the expensive it would be. So if you need the dining table for about eight people then it is better to make a pallet dining table which won’t cost you much and would fulfill your need as well. You just have to be creative and put in a little effort to construct a pallet dining table. If you don’t want the wooden top you can place a glass top on the pallet dining table which would make it looks awesome in your dining room. Decorate it with a flower vase to give it an elegant look. The more you keep it free of space the more it looks good. You can even cover the glass with a beautiful Matt so that you don’t end up ruining the glass on daily basis but if you have guests over then it could be presented with a vase on it.